That makes sense, I hadn't thought about the prize pool/historical company collection. And your right-if Skawilly hadn't been there it would have just been a "funny die" to the player until eventually someone either told him or fleeced him for it (I could easily see either scenario playing out). Big kudos to Skawilly for being honest and watching out for the new player. one of the best stories was from... I think it was Will Lutz or possibly Scott Cobbs. When the very first Scalder cases came out no one knew what the 'rare' monster was gonna be. so based on opening a few cases they decided it had to be the Quickling. After all they only had one quickling and three fairies... lucky ducks. Maybe it is a stupid question, but how can I find out the rarity of the monsters? I use Chuckpints's DD-page as a rough reference. 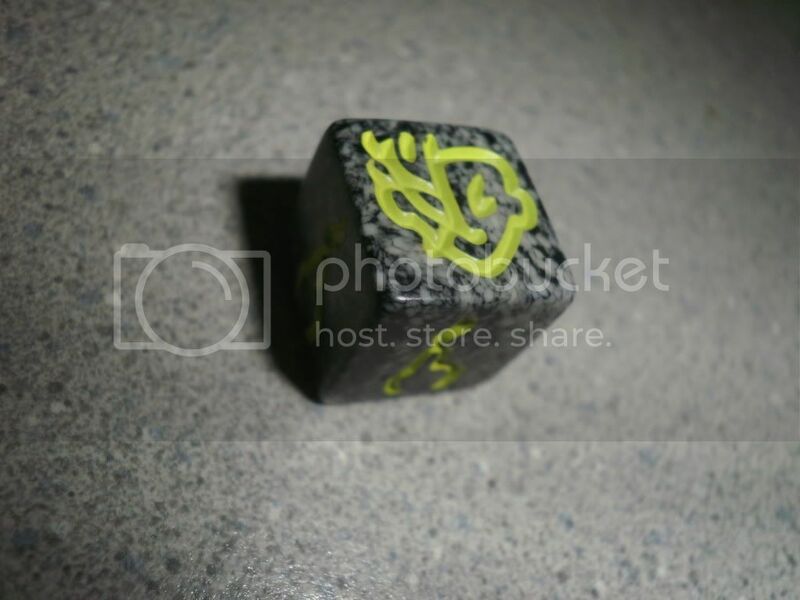 Basically, the more valuable Chuck thinks the die is, the rarer it I think it is. Are some monsters more rare than others, or just more wanted? I mean current printed stuff, not older/promo/etc. There's an exhaustively thorough answer to this on Chuck's page, linked above, under FAQs - Q: What are the different rarities of the dice in the kickers? It's worth a read if you're interested, and explains both the rarities and why they apply to both past and current product. Edit: suffice it to say, at the bare minimum, that each race has one monster that's more rare than the others, and that Chuck's prices typically reflect this accordingly. 1949 dice down, innumerable more to go! but the rarity is not the same for all races. sadly the frostwings and scalders are the worst. Here's the misprint that was found recently by one of our new players. It was heavily traded (twice in less than 15 minutes ). All parties involved were (and I hope still are) very happy with the result of this trade . "No dice were harmed in the making of this trade"
Thank You to all involved with this deal, it was alot of fun! Two new players-Happy, one old player/collector-Very Happy! one rep director's boss very sad, but patient. So, have orders for Undead starters increased yet? Dont worry Mr. Wiggs, if I see a new guy come across such an artifact again I promise I will pull a shifty move and kipe it for you. Maybe trade a fen hound for it? Beheheh. Are you sure I can't tempt this away from you? not even for something... unseen? Tempting...hmmm......very tempting, please elaborate, I'm listening. Please PM, I'm very curious now! I don't have an undead firewalker, Chuck does. I have a bunch of Scalder conscripts. If only took 1,115 days, but guess what is mine now! You were counting the days? What about hours, minutes and seconds? It was one of the "jewels" of my collection. Enjoy! It's very cool! OK, now I'm really curious!